Brian Mastenbrook's lisppaste has some great paren matching mouseover magic. Sorry. My fault. CL.net went down, and I had a bug which caused some pastes to not get read back in (and now I lost some pastes, actually - oops). It's back up now. 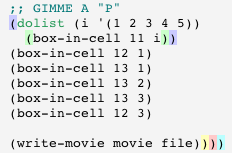 If you like highlighted parentheses, I've just thrown up a mini-screenshot of an emacs font-lock mode James Knight wrote for the Goo programming language long ago at my MT test blog. It's at http://www.onlythewind.org/mt/ but I fully expect for spammer avoidance that link might not work. If it doesn't, it appears that clicking on my name might go there. If you like the shot, feel free to link it or copy it or what not.